Here is a brief synopsis of my new novel, Cracks in the Wall, which is in the final stages of design and proofreading before publication. Watch this blog for the upcoming exact release date. Parker Havenot, a former Philadelphia homicide detective, faces one of the most difficult challenges of his stellar career when a rare murder rocks his small town of Hampton Village, Connecticut. Date of publication is yet to be determined but here is the likely front jacket of my new book. I am hoping for a good editing report so the road to publication will be smooth. Some have asked about the title of my new book. What does “Cracks in the Wall” mean? For a change, this post has nothing to do with the Stacey Burns murder. It has to do with my grandson, Ben. With apologies to Art Linkletter, I do agree with his famous cliché that kids do say the darndest things. With Ben, I will change that to kids say great things. Two nights ago, I was working on a crucial scene in my work-in-progress-almost-finished-novel. It is a conversation between a boy and his dad about the deer hanging in the back yard, a hunting success for the father. I hit a major slowdown in progress over the last month and half due to factors somewhat beyond my control. However, the novel, expected to be in the 63,000 words range, now stands at 55,000 “keeper” words so more than 85% completed. If all goes according to plan, it will be in the editing stage within a month. The photo captures my father in his race car in 1950, just prior to a horrible crash in which he should have been killed but survived with minor scratches. 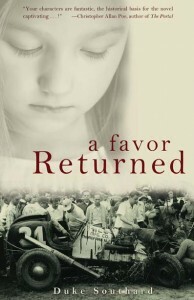 That accident is the basis for the opening chapter of my first novel, A Favor Returned. Those of you who have read Live Free or Die have read (maybe) the beginning chapters of my fourth novel, Cracks in the Wall. I do get asked how that book is coming along so I thought I’d give everyone a brief update. I am in the middle of Chapter Eleven, just over 25,000 words along with an anticipated length of 72,000- 75,000 words. The story is developing the same type of momentum that Live Free or Die did when I was finishing that book last fall. Watch for future updates here.